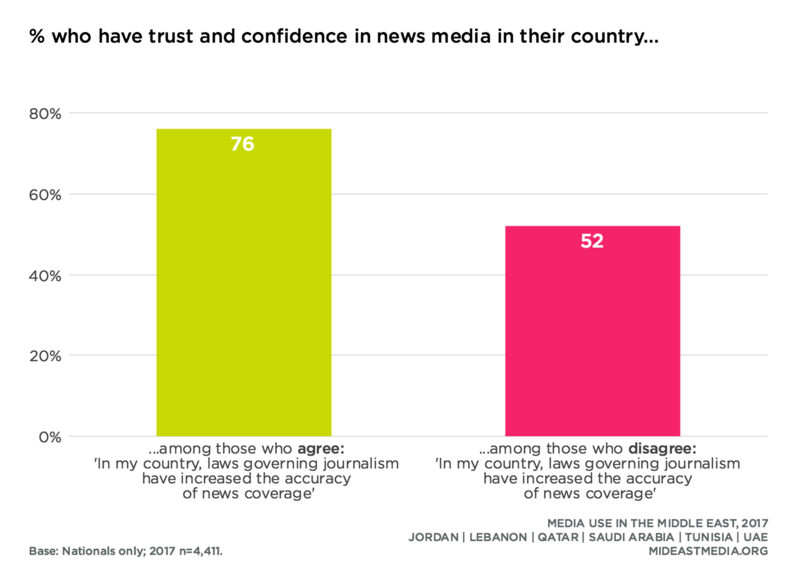 Two-thirds of Arab nationals overall say they trust mass media such as newspapers, TV, and radio to report news fully, fairly, and accurately, but there is variation by country. Ratings of media trust are very high in the UAE and Saudi Arabia and are lower—but still over half—in Tunisia (88% UAE, 78% KSA, 64% Jordan, 64% Lebanon, 64% Qatar, 56% Tunisia). In comparison, a 2016 Gallup poll revealed that just 32% of Americans trust the mass media (Gallup, 2016). Nationals are more likely to trust mass media in their own country than to trust media from elsewhere. 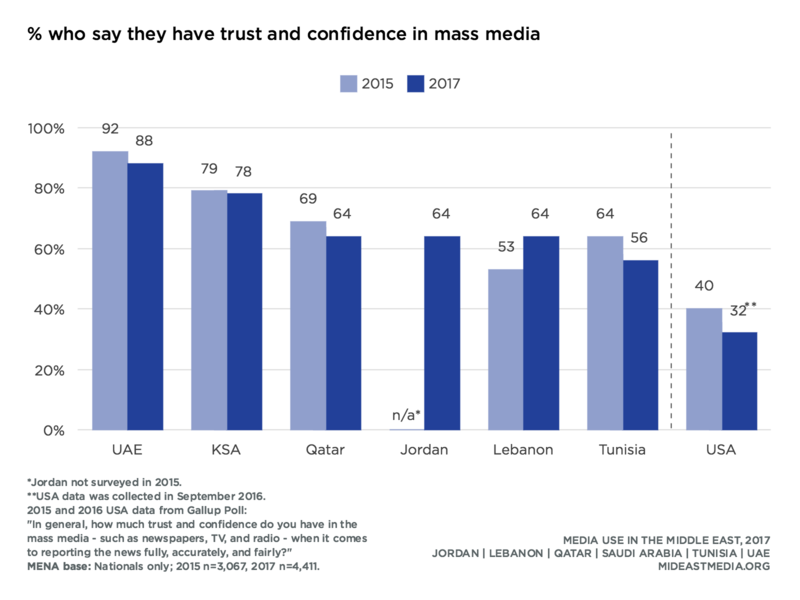 Two-thirds of nationals say they trust mass media from their own country, compared to only half who trust media from other Arab or Western countries (66% own country, 52% Arab world, 49% Western countries). Fewer than half trust news on social media, but this varies widely by country. More than half trust social media news in Lebanon, Saudi Arabia, and the UAE compared with about one-third in Jordan, Qatar, and Tunisia (58% Lebanon, 56% Saudi Arabia, 56% UAE vs. 40% Jordan, 35% Qatar, 36% Tunisia). Those in Qatar and the UAE are least likely to trust news from Western countries and are even more likely to trust social media than Western media (Qataris: 35% social media vs. 28% Western media; Emiratis: 56% social media vs. 38% Western media). Compared with 2015, more nationals in Lebanon trust mass media to report the news fully, fairly, and accurately, increasing from about one half to two-thirds (53% in 2015 vs. 64% in 2017). Conversely, trust in media declined in Tunisia (64% in 2015 vs. 56% in 2017). Nationals express less trust than expatriates in all mass media, including media in their own country. Eight in 10 expatriates say they trust the mass media in the country where they reside, compared to two-thirds of country nationals (66% Nationals vs. 80% Arab expats, 79% Asian expats, 82% Western expats). 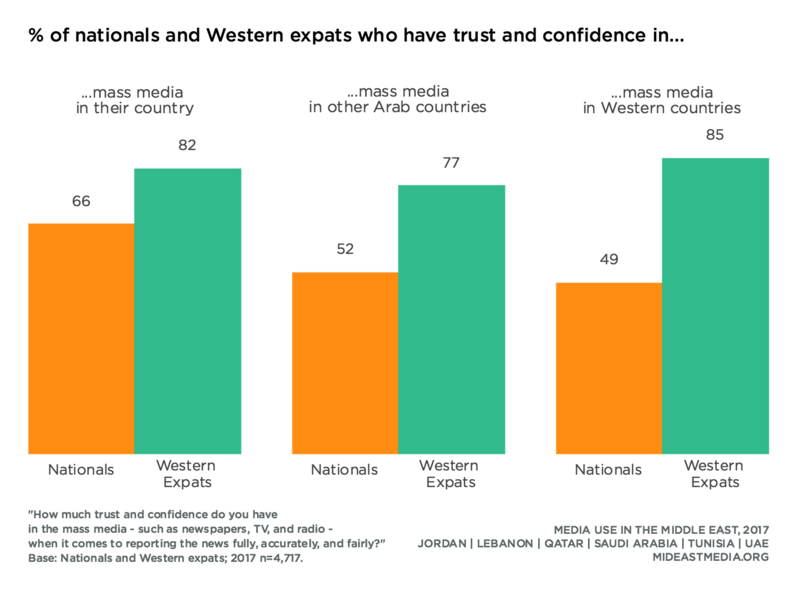 Arab nationals and Arab expatriates are less likely to trust mass media from Western countries compared with Asian and Western expatriates (49% Nationals, 51% Arab expats vs. 71% Asian expats, 85% Western expats). 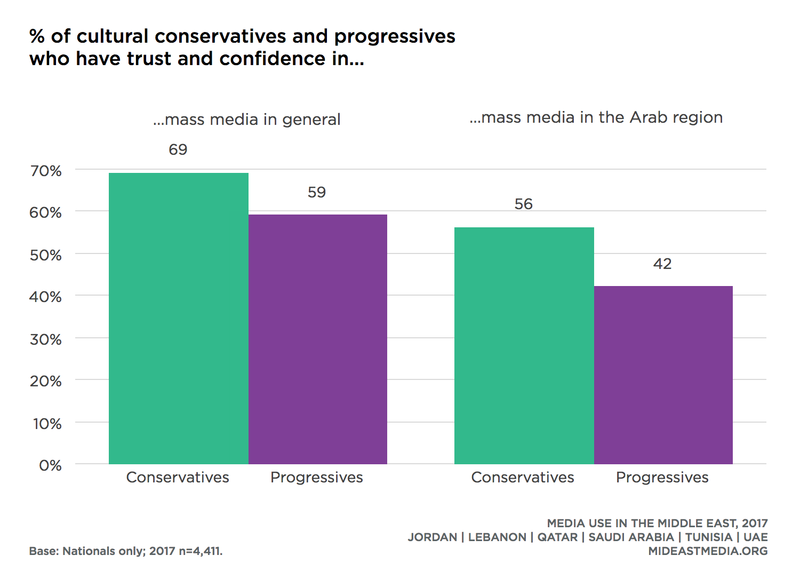 Self-described conservative nationals are more likely than progressives to say they trust mass media in general, media in their own country, and media from the Arab world outside their country (mass media in general: 69% conservative vs. 59% progressive; own country: 69% conservative vs. 62% progressive; Arab world: 56% conservative vs. 42% progressive). Nationals who find benefits to consuming news from foreign organizations are twice as likely as those who do not agree to say they trust mass media from Western countries (trust Western media: 60% agree in benefits of foreign news vs. 30% disagree). Those who see benefits in foreign news are also more likely to trust media from other Arab countries and from social media (mass media from other Arab countries: 56% agree vs. 41% disagree; social media: 51% agree vs. 40% disagree). Arab nationals who say media in their country can report news without interference from officials are more likely to trust the media in their country (72% agree vs. 61% disagree). They are also more likely to trust the media from other Arab countries, from Western countries, and social media. About four in 10 nationals say laws regulating journalism in their country improve the accuracy of news coverage (43%). This varies by country, however, from a high of seven in 10 in the UAE to only about one-third in Jordan. Those who feel laws in their country improve news accuracy are also more likely to trust the mass media in their country—by 24 percentage points (76% agree that laws increase accuracy vs. 52% disagree). Respondents were asked if they thought international news organizations’ coverage is fair, biased against, or biased in favor of their own country, the Arab world outside their country, and the Western world. Nationals are most likely to say news coverage is biased against the Arab world followed by their own country. Fewer think coverage is biased against the Western world (33% Arab world, 28% own country, 21% Western world). Perceptions of bias in news coverage vary widely by country. A majority of Qataris feel international news organizations’ coverage of Qatar is fair (60%). Four in 10 Emiratis and Saudis say international news is fair or biased in favor of their countries, and almost no Emiratis perceive a negative bias (UAE: 42% biased in favor, 49% fair, 6% against; KSA: 40% biased in favor, 40% fair, 18% against). In contrast, more than half in Lebanon believe coverage is biased against their country (53%). Similar patterns emerge in perceptions of international news organizations’ coverage of the Arab world outside their country. Qataris are more likely than other nationals to say coverage of the Arab region is fair, while Lebanese are the most likely to feel it is biased against the Arab world. With regard to the Western world, nationals in Jordan, Saudi Arabia, and Tunisia are equally likely to say news coverage is favorable as unfavorable. Qataris are most likely to say coverage of the Western world is fair. Emiratis are twice as likely to say coverage is biased in favor of the Western world than against (43% biased in favor vs. 20% biased against). 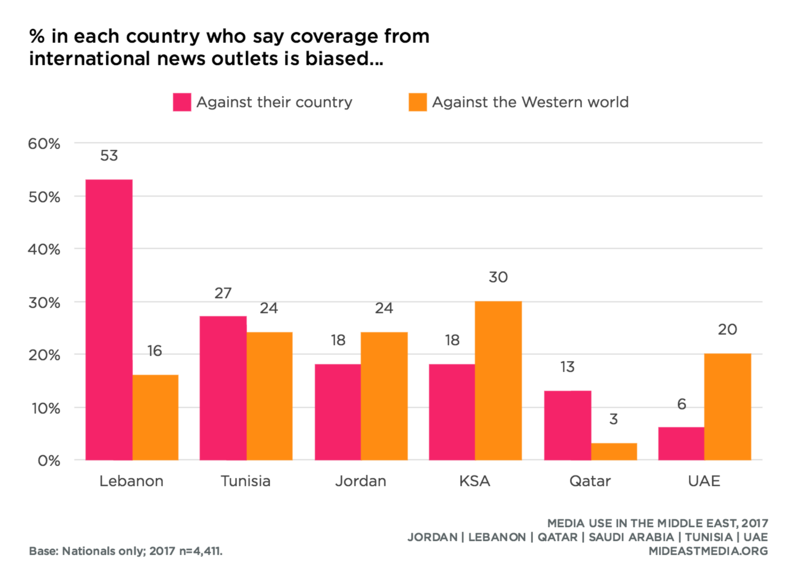 Lebanese are among the least likely to say news coverage is biased against the Western world while the most likely to say it is biased against their country and the Arab world (biased against Western world: 16%; own country: 53%; Arab world: 57%). Cultural progressives are more likely than conservatives to say international news is biased against their country and the Arab world (biased against this country: 35% progressive vs. 26% conservative; biased against the Arab world: 40% vs. 31%). A few notable changes in perceptions of bias have emerged since 2015. The proportion of Saudis who say news coverage is biased against their country declined from 38% in 2015 to only 18% in 2017. In all other countries, perceptions of a negative news bias increased or remained the same since 2015. Since 2015, perception of a negative bias against the West increased in Saudi Arabia and the UAE, but declined in Qatar (KSA: 12% in 2015 vs. 30% in 2017; UAE: 8% in 2015 vs. 20% in 2017; Qatar: 26% in 2015 vs. 3% in 2017). Nearly half of nationals believe news media in their country are credible (47%). About four in 10 believe that journalism laws in their country improve the accuracy of news coverage (43%) and media in their country can report news without interference from officials (38%). Perceptions of media credibility vary considerably by country. More Emiratis, Qataris, and Saudis believe their news media to be credible than Tunisians, Jordanians, and Lebanese (85% UAE, 62% Qatari, 59% KSA vs. 45% Tunisia, 38% Jordan, 38% Lebanon). Emiratis are far more likely than other nationals to say their nation’s journalism laws increase the accuracy of news coverage (69% UAE vs. 51% KSA, 48% Qatar, 44% Lebanon, 38% Tunisian, 34% Jordan). Since 2013, perceptions of news credibility increased in most countries but fell in Jordan and Saudi Arabia (Lebanon: 25% in 2013 vs. 38% in 2017; Qatar: 57% vs. 62%; Tunisia: 23% vs. 45%; UAE: 73% vs. 85%; Jordan 66% vs. 38%; KSA: 73% vs. 59%). 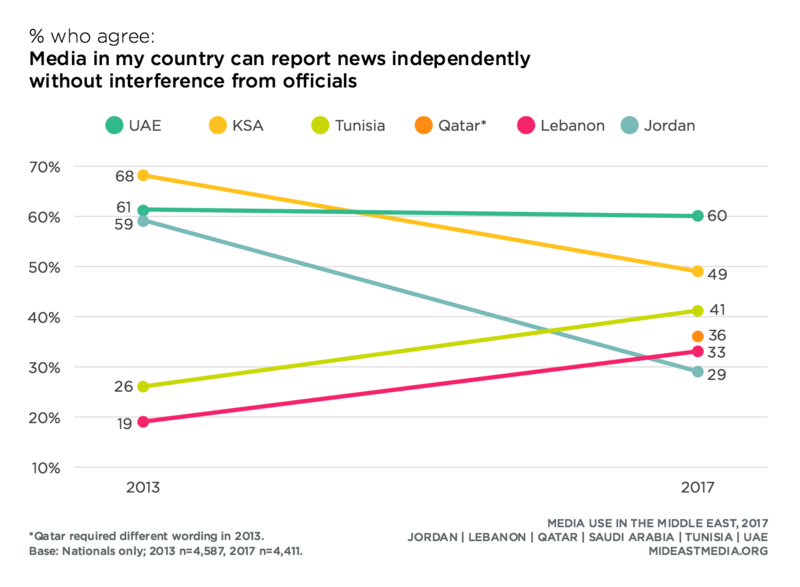 The belief that media can report the news without interference from officials decreased from 2013 to 2017 in Jordan, Qatar, and Saudi Arabia, but increased in Lebanon and Tunisia (Jordan: 59% in 2013 vs. 29% in 2017; Qatar: 52% vs. 36%; KSA: 68% vs. 49%; UAE: 61% vs. 60%; Lebanon: 19% vs. 33%; Tunisia: 26% vs. 41%). 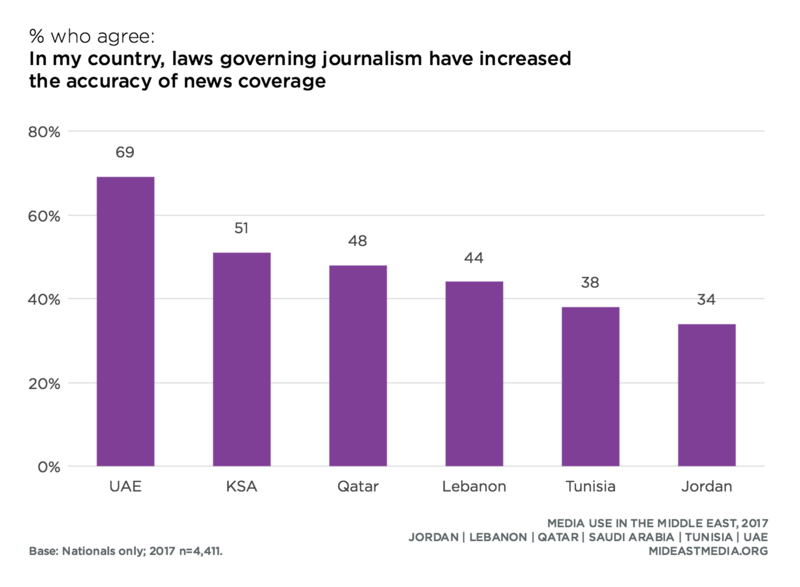 Believing that laws governing journalism increase the accuracy of news varies from one-third of nationals in Jordan to nearly seven in 10 in the UAE. A few differences emerge by nationality. A smaller proportion of nationals than expatriates view the news media in their country of residence as credible (47% Nationals vs. 66% Arab expats, 55% Asian expats, 61% Western expats). Also, nationals express skepticism more broadly than expatriates that news media in their country can report without interference from officials (26% Nationals disagree vs. 14% Arab nationals, 19% Asian expats, 15% Western expats). Respondents with more education are more likely to express trust in mass media (news media is credible: 43% primary or less vs. 51% university or higher; laws governing journalism increase news accuracy: 33% primary or less vs. 46% university or higher; media can report the news independently: 33% primary or less vs. 42% university or higher). Nationals who say media in their country can report the news without interference from officials are twice as likely as those who disagree to say their news media are credible and that journalism laws have increased news accuracy (news media are credible: 68% agree vs. 31% disagree; laws increase news accuracy: 67% agree vs. 28% disagree). Six in 10 nationals say it is okay for news to report on problems in their community with little variation across countries, slightly more agree in Qatar and the UAE and slightly less agree in Tunisia (68% Qatar, 68% UAE, 53% Tunisia). Fewer than half of nationals believe that people benefit from consuming news from foreign news organizations (43%). 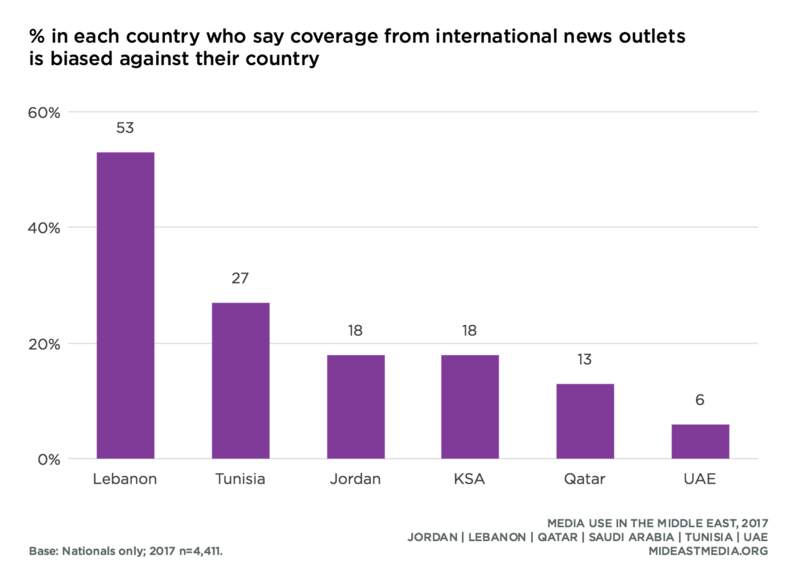 Lebanese, Saudis, and Tunisians are more likely to see the benefits of foreign news than Qataris, Jordanians, and Emiratis (54% Lebanon, 50% KSA, 48% Tunisia, vs. 33% Qatar, 28% UAE, 28% Jordan). 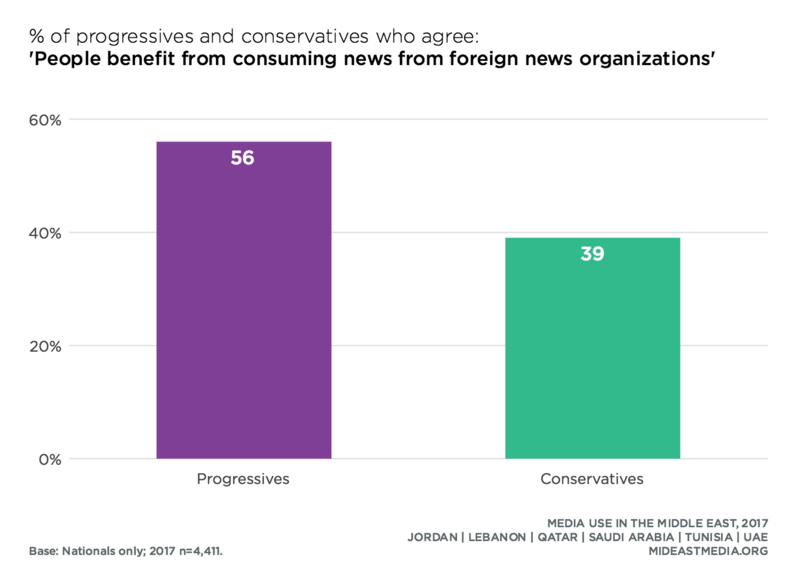 Cultural progressives are more likely than conservatives to see the benefits of consuming foreign news (56% progressive vs. 39% conservative). Belief that foreign news is beneficial increases with education level (35% primary or less, 37% intermediate, 44% secondary, 47% university or more).